The trend of atmospheric carbon dioxide is up. Graphic courtesy of NOAA. Major weather changes take place seasonally around the globe. Nobody raises an eyebrow when the temperature changes by 40F in New York between January and July. But large departures from normal for a date catch everyone’s attention. Extreme weather seems to be more frequent lately. Is this because it is more widely and accurately reported? Because there are more people (over seven billion now) in more places to observe it? Because those people have put buildings and infrastructure where the effect is more noticeable? Or is the weather actually changing in response to an increase of greenhouse gases in the atmosphere? March was a good case for the latter. Precipitated by the far-flung effects of El Niño, the eastern US has endured two bouts of unprecedented warmth this winter. On Christmas Eve, high temperature records were shattered from the southeast to New England. Many cities broke their previous records by double-digits, with Burlington, Vermont taking the prize by exceeding its previous high for the date by 17°F. The second week of March saw round two: Records fell in eight states on March 9: Albany, New York; Allentown, Pennsylvania; Hartford, Connecticut; Newark, New Jersey; Poughkeepsie, New York; and Trenton, New Jersey all saw their earliest first 80s on record. The record-smashing high temperature of 81 degrees at Albany, New York, was 40 degrees above the average high of 41° for the date. A comparable departure from the normal high in July would imply a temperature of 122°F. March probably saw the last powerful blast from one of the most significant El Niños ever: Deluges on the west coast and the Gulf Coast. The winter pattern of powerful jet stream winds across the Pacific steering storms into the American west coast is about to change. Conditions in the Pacific will become neutral by May, and probably La Niña will appear in midsummer. Cooler water temperatures are moving east across the tropical Pacific. Graphic courtesy of NOAA. The last comparable El Niño, in 1998-99, collapsed rapidly during the winter and was followed by a powerful and long-lived La Niña. Water temperatures are dropping rapidly over the Pacific, and a repeat is likely. The March drenching from California to Washington state and from Texas to Florida shows how influential El Niño is. As the jet stream pushes eastward from the central Pacific, curls in the flow produce the lifting needed to squeeze out the moisture. When the jet stream carries moisture into California or meets moisture from the Gulf of Mexico, copious rain is the result. The Pineapple Express delivered double-digit rainfall amouts (in inches) to central and northen California, soemwhat less to the south. In the Sierras, the snowfall measured several feet. Louisiana bore the brunt of the assault in the east, though Texas and Arkansas got drenched too. New Orleans received over a foot of rain. The transition to La Niña doesn’t always occur, but the trajectory of indicators implies that this one will be like 1998. The majority of model forecasts agree. Though El Niño delivered the expected enhancement in rainfall along the Pcific Coast, the largest amounts fell from central California northward. Southern California, though it received some relief from the drought, got only an average winter’s worth of precipitation. The forecast for the drought-sufferers is clouded with uncertainty: El Niño is leaving and the dry summer season is approaching. On the other hand, the warm pool of ocean water in the Gulf of Alaska, named The Blob by some unimaginative meteorologist, is gone. In fact it has been replaced by an anti-Blob (might as well go along), a colder than normal pool of water. The Blob exacerbated the drought by encouraging high pressure to form off the coast. The anti-Blob has had the opposite effect, contributing to the El Niño-caused powerful jet stream over the Pacific. Sea surface temperatures (SST) are critical to the global atmospheric flow, so the temperatures in the northern Pacific after El Niño could be crucial to the west coast drought. And speaking of anti Blobs: There is one in the Atlantic also. This feature has persisted for a couple of years, and has contributed to warm weather in Europe. Of interest to residents of the east and Gulf coasts of the US, the cold water appears, in the latest SST analysis, to be spilling down the African coast into the tropical Atlantic. Decoded Science has pointed out that the water south of the Cape Verde islands, breeding ground for major Atlantic hurricanes, has been very warm. This, in combination with an expected La Niña, has induced us to warn that the coming summer could be an active hurricane season in the Atlantic. If the anti-Blob penetrates far enough south, it could stifle the formation of major storms. Are Arctic Temperatures Our Canary? Much has been made of the two degree Celsius temperature rise that many meteorologists feel is the tipping point for the circulation of the atmosphere-ocean system. The circulation has been different in the past, as temperatures rose and fell, and in the very long term was affected by changing distribution of land masses due to continental drift. There’s nothing magic about 2°c. Certainly a rise of that much, distributed uniformly over the earth, though disruptive, would not be catastrophic. The fear among climatologists is that the effects of global warming will not be uniform — or even nearly so — and with an average global rise of about 1.1C since pre-industrial days, major changes may already be taking place. Witness the Arctic. The Danish Meteorological Institute has been measuring temperatures north of 80º north latitude since 1958. The results are startling. In 1966, arctic temperatures averaged near normal. Graphic courtesy of DMI. At the beginning of the survey, the temperatures stayed relatively close to the long-term average. Then winter temperatures began to fluctuate wildly, mostly above normal. More recently, the winter temperature has stayed at or above normal, with occasional readings more than 15°C (27°F) above normal. As Decoded Science pointed out last month, the Arctic temperature has been more then 4°C above average continuously since Christmas. The result has been shrinking sea ice extent to record low coverage. Since Christmas, arctic temperatures have averaged 7C above normal. Graphic courtesy of DMI. None of the above is meant to be quantitatively predictive. But such large departures from the long-term averages, especially coming within the last 50 years as in the arctic data, suggests that the atmosphere may already be reacting to a relatively minor change in global average temperatures, the way one with an allergy might react to a bee sting. At the start of the industrial revolution, atmospheric carbon dioxide measured 280 parts per million (ppm). Recently the number went over 400 ppm. Last week, the average set a new record on Mount Mauna Loa in Hawaii at 406 ppm. El Niño years tend to produce higher levels of carbon dioxide, but the trend is ominous. The seasonal maximum, which occurs in May, will certainly set a new record that will stand — until next year’s maximum. Climate-change deniers can argue every which way about temperatures. But there is no disputing the CO2 figures. And there is no disputing the effect: Carbon dioxide is transparent to incoming solar radiation but absorbs the earth’s outgoing microwave radiation. An increase in atmospheric carbon dioxide cannot plausibly have any other effect than to trap heat in the atmosphere. Tornado Season Is Here. Why Now? 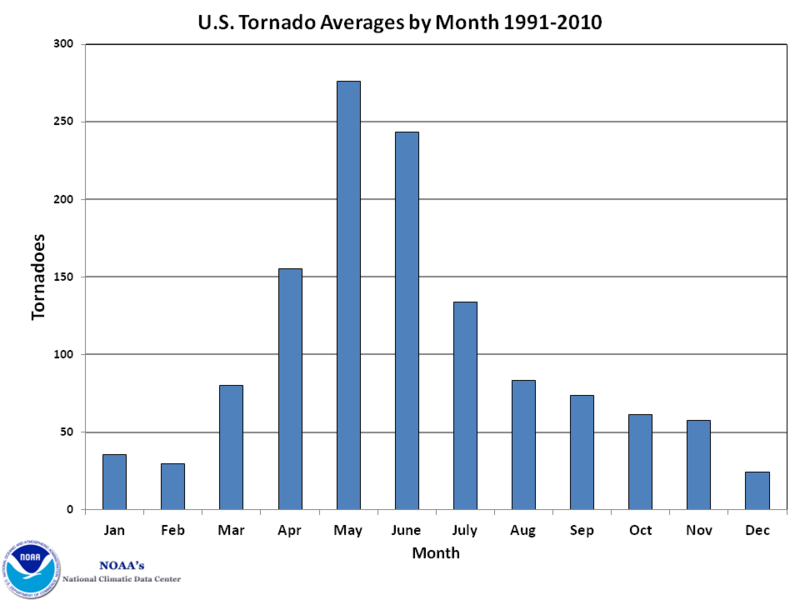 Tornado activity in the US ramps up in March and April, peaks in May and June. Graphic courtesy of NOAA. Spring and early summer is tornado time in the US, particularly in places where moisture from the Gulf of Mexico has a clear path. Spring also affords the second and third ingredients for tornado stew: instability and lift. As the sun gets higher in the sky in the northern hemisphere spring, the ground heats up and some heat is conducted into the lowest level of air. The warmth spreads upwards through the spring months, but the addition of heat from the bottom means the atmosphere becomes less stable. A parcel of air, when lifted, has a tendency to keep rising because it finds itself warmer than surroundings. The lifting is generated in two ways: Through daytime heating near the ground; Through the vertical motions associated with troughs in the jet stream. Now we can see why spring is the favored time for tornadoes east of the Rockies and north of the Gulf of Mexico. The cold surface flow of winter is replaced by first occasional and then frequent flows from the south, bringing warm, humid air from the Gulf into the deep south, then the midwest and plains. The air is naturally less stable due to the increased sunshine heating the ground and the lower atmosphere. And the jet stream of winter still influences the weather across the lower latitudes. Put all these together and you get a tornado outbreak like the one this past weekend. As El Niño weakens, major changes can be expected in the weather over the continental US. We have already seen a new incursion of arctic air in the east, and a complementary southward push of our old nemesis, the polar vortex. The composite jet stream forecast for the next five days shows the polar vortex remaining strong over the eastern US as the Pineapple Express tries for one more foray into California. Graphic courtesy of NOAA. The midwest and east will stay cold and stormy for at least another week. El Niño will make one more push towards southern California before fading out. April promises to be the transition month March is supposed to be as the lions of winter are replaced by the lambs of spring. Let Decoded Science know what changes you see where you live. Decoded Science published a Weather Around The World column every week in 2015, as well as monthly reports on global air and sea temperatures. All these articles are compiled in the new ebook, Weather Around The World 2015, to be published soon.